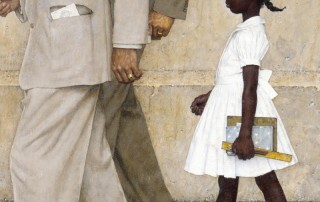 The significance of Rockwell’s vision of an “ideal” America. 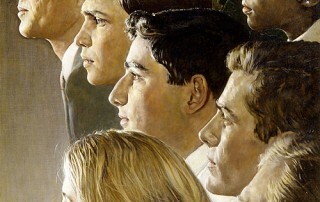 The idea of utopia within American thought. 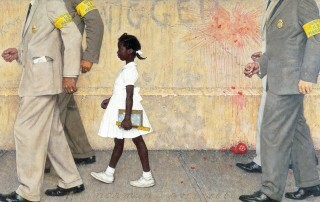 Students will develop critical thinking skills by analyzing the ideals presented in Norman Rockwell’s Saturday Evening Post imagery. Students will study and reflect on the notion of an ideal society through investigation of utopian writings. 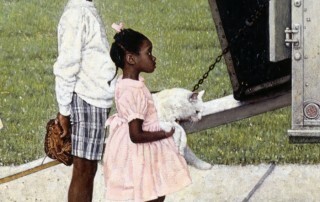 Show students prints of Rockwell illustrations that depict American life in the 20th century. Discuss how NR would use his friends and neighbors to model for him. 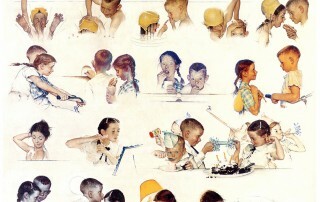 To consider Norman Rockwell’s imagery as a means of helping students reconsider their familiar cultural and community contexts. 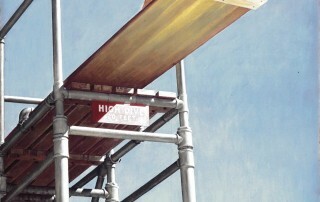 Students will reevaluate their own communities by giving attention to details they have overlooked. 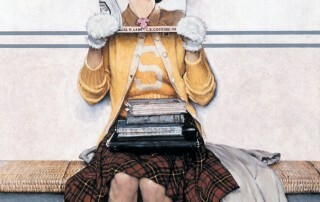 Use Norman Rockwell’s Saturday Evening Post covers to teach words and build communication skills. 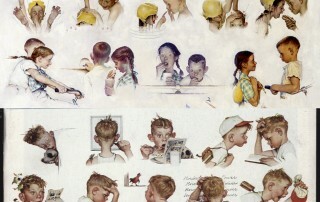 Use Norman Rockwell’s illustrations to build children’s emotional vocabulary. 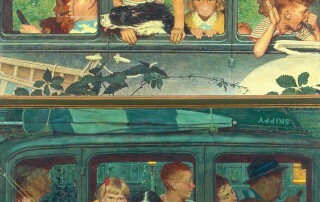 Use Norman Rockwell’s Post covers to spark creative writing. 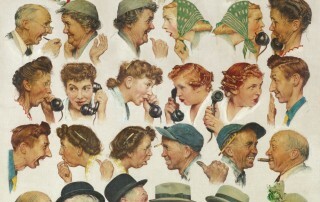 Build writing skills and language skills as you speculate on what the characters in Rockwell’s The Gossips are talking about. 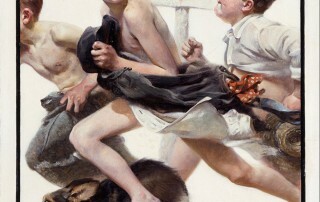 Tell short stories inspired by Rockwell’s work. 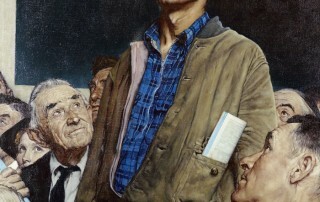 Build descriptive language skills as you pretend to be Norman Rockwell directing a model. 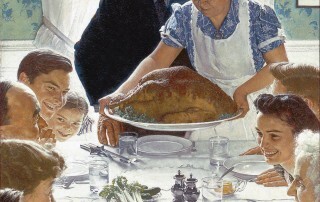 Practice language associated with mealtime. 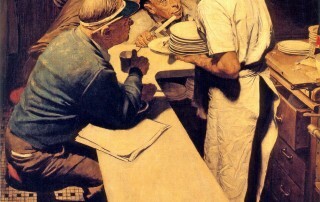 Investigate the Invasion of Normandy as you explore Rockwell’s painting, “War news”. 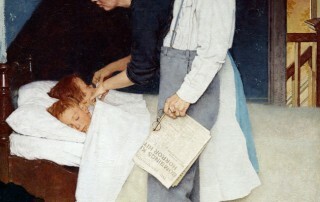 In this painting Rockwell tells the story of a little girl’s day by portraying small moments in her morning, afternoon, and night. 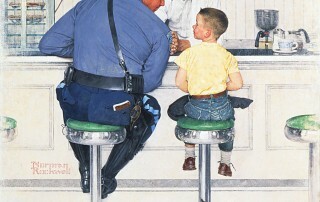 It was created for the Post and is a companion to Rockwell’s prior Post cover, Day in the Life of a Little Boy [insert link]. Rockwell was known for his ability to tell a complete story within each of his images.